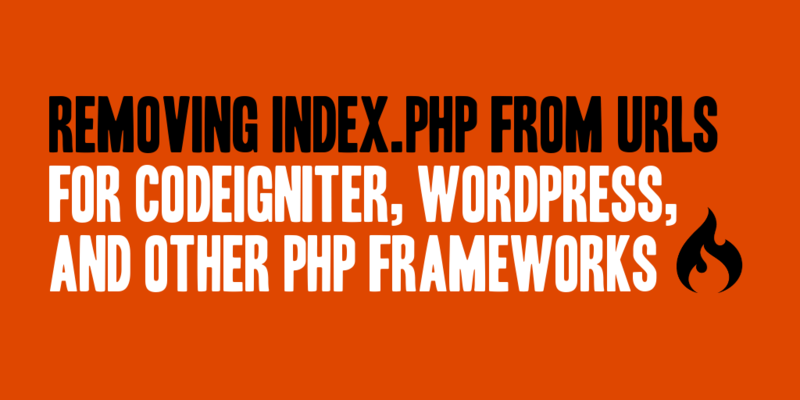 When working with a PHP framework such as CodeIgniter, and I’ve found this same configuration works for WordPress as well, you can eliminate the need to reference index.php as part of the URL, by utilizing the following .htaccess file entry. This configuration does require that you have mod_rewrite installed and enabled on your HTTP server. If you have not done so, the configurations will not do anything. You will need to put these directives into a .htaccess file located at the root of your web site, the same location your index.php file resides. 1. Simple Configuration: This configuration is a basic example for removing the index.php file from your web site. It simply takes a request, ensures the file being requested doesn’t exist, and rewrites the URL server side to include the index.php file. The external URL will remain without the index.php allowing your URLs to remain clean. If the actual file being requested does exist, it will not rewrite your URL, and the URL will remain as is allowing the file to be retrieved. 2. Moderate Configuration: This configuration builds upon the previous configuration. It takes any request routed to your non-www domain and redirects them through a forced 301 to the www based domain. This keeps all incoming traffic hitting the exact domain you specify. This could also be reversed if you don’t want all of your web addresses to keep the www. prefix. If you utilize subdomains on your web site you may run into some issues with this configuration. 3. Advanced Configuration: This configuration also builds upon the previous configuration. It will remove the index.php from the URL if it exists and force a 301 redirect to a non-index.php URL. I’ve found this to be especially useful if for some reason your pages get indexed with an index.php reference in the URL, such as if Google found your web site before you configured it the way you wanted. So, as a recap, the three configurations above will allow you to remove the index.php page from all of your URL requests; and depending upon the configuration you choose, will also allow you to specify the specific domain you want to use or remove the index.php page from URLs through a redirect. I generally utilize the Advanced Configuration on all of the projects I take on, personal or freelance, and find this accommodates 99.9% of all needs. 4. GoDaddy Basic Configuration: GoDaddy has a slightly different default HTTP server configuration and I had to adjust the directive to accomodate GoDaddy’s servers. You can also apply many of the other configuration directives here; however, I have provided a basic configuration example. The major difference is appending the ‘?’ to the index.php rewrite rule.